Home » Think about it – what’s the child within like? 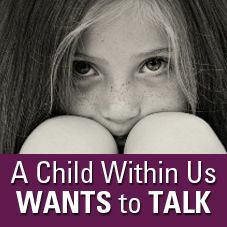 » Think about it – what’s our child within like? Think about it – what’s our child within like? Title: Think about it – what’s our child within like? Think about it – what’s the child within like? A child is open and in awe of life. From the simplest things to the complicated – the child sees awe in all of it. And we all started out this way. But – it doesn’t last. We are open, we are in awe – and then something happens to make us close down. Maybe there’s violence at home, or something happens in the world that takes away from awe. And instead of getting discerning and realising that not all life is awe, but a lot of life can be like that – we generalise and close down in order to protect ourselves. If we are to transform, if we are to live our recovery, if we are truly able to be of service to others – we must, I repeat, must learn to transform skepticism back into discernment. We close down because we don’t want to get hurt. But closing down is what hurts most. How can you open up to your child within a little today? How can you begin to see that just because it’s always been that way doesn’t mean it will always be that way? Can you open up and trust, but also apply what you’ve learned so that you are wiser and better off for it? Remember, when you numb your pain, you numb your joy – don’t let the childhood fear of getting hurt stop you from living your recovery. Is skepticism killing your recovery NOW? If so, what small change in your perceptions could you make today to allow yourself to be brand new in this moment? The child within you will prove your fears wrong if you let it in TODAY. Labels: Think about it – what’s the child within like?